Williamsburg@: 'SOTU Address'; 1,000 Days Without A Budget; Sign-Up for 'GA' Email Alerts! 'SOTU Address'; 1,000 Days Without A Budget; Sign-Up for 'GA' Email Alerts! 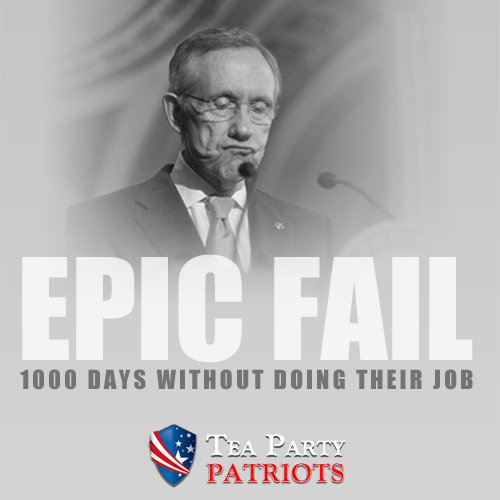 1,000 Days Without A Budget! Today, you MUST call your US Senators and tell them to do their jobs! Why? Because if you don't, who will? Today marks the 1000th day that the US Senate has not produced a budget. A budget is one of the most basic and fundamental requirements of our legislature and now for 1000 days, the Senate has failed. What would happen to you if you failed to do your job for 1000 days? You would lose your job. In this environment of economic turmoil, how can we let these servants of the people get by without actually serving the people? What's more, today the President is also slated to give his State of the Union Address. What is the state of our union? No Budget. No Direction. No Leadership. Please sign up via link for action alerts for the VERY important bills listed below. At this time the COLA committee will NOT be sending out phone alerts. They will be doing email alerts instead and/or we will be sending out alerts for super important votes so you can make that *one* phone call to support freedom. Thanks so much, this is so important. We are trying to make this very easy for everyone!  MORE FAILED ‘STIMULUS’ SPENDING. In 2009, President Obama delivered his first address to a joint session of Congress exactly one week after signing the trillion-dollar ‘stimulus’ into law – promising it would “save or create 3.5 million jobs.” The plan was a bust – leaving Americans with 600,000 fewer jobs than when the ‘stimulus’ was enacted, and an unemployment rate stuck above eight percent for a record-breaking 35 consecutive months. Two years later, President Obama made his call for more government spending the focus of his 2011 State of the Union, proposing to “redouble” the same ‘stimulus’ efforts that fell short. Out-of-touch Democrats have proven time and again that they won’t let the stimulus’ failures get in the way of their reckless spending spree, expect more of the same this year.  MORE EMPTY RHETORIC ON FISCAL RESPONSIBILITY. In 2009, President Obama said “it has never been more important to…do what it takes to bring this deficit down,” promising to “cut the deficit in half” by the end of his first term. One year later, he warned that “if we don’t take meaningful steps to rein in our debt, it could damage our markets, increase the cost of borrowing, and jeopardize our recovery – all of which would have an even worse effect on our job growth and family incomes.” The discrepancy between President Obama’s rhetoric and his record is glaring. Since taking office, Democrats in Washington have piled $4.6 trillion on to the national debt – which has now eclipsed the size of the entire U.S. economy – and tripled the deficit. Instead of leading, President Obama punted with his 2011 budget – a “remarkably weak and timid” document that failed to cut spending or address the skyrocketing debt. And it appears the president is poised to offer more the same failed policies this year, further extending the damage Democrats’ policies are causing the economy.  MORE WORDS WITHOUT ACTION ON REINING IN REGULATIONS. Last year, President Obama ordered a “top-to-bottom” review of government regulations and pledged that “when we find rules that put an unnecessary burden on businesses, we will fix them.” The results of the review drew “yawns and more sharp criticism” from job creators who said they did not go far enough to roll back the onslaught of red tape coming out of Washington. There are currently more than 4,000 regulations in the pipeline, 219 of which will have a major impact on the economy. If President Obama is serious about keeping his pledge, he should urge Senate Democrats to pass the nearly 30 bipartisan jobs bills – many of which rein in excessive government regulations - collecting dust on their doorstep.  A NEW SLOGAN? With observers already characterizing the State of the Union as President Obama’s “big campaign speech,” it only seems reasonable to expect more slogans than solutions from this year’s address. Since President Obama decided to stop governing months ago, it is clear that 2011’s “winning the future” has already given way to 2012’s “winning the next election.” So – what fleeting catch phrase does President’s Obama have lined up for us this year? “We can’t wait” to see. Visit GOP.gov/SOTU tonight at 9:00 PM ET to hear the president's remarks, followed by the Republican Address to the Nation, and share your questions with House Republicans. Sign-up for Hillsdale College LIVE Webcast: "Bureaucratic Despotism or the Constitution"
"Our Choice Today: Bureaucratic Despotism or the Constitution" is an online town hall brought to you by Hillsdale College's Allan P. Kirby, Jr. Center for Constitutional Studies and Citizenship. The town hall will air as a live, interactive webcast on January 28, 2012. During the live webcast you will be able to ask questions of our speakers. First Meeting is: February 27th @ JCC Library; 7770 Croaker Rd., 7PM- More Info Coming Soon! Copyright © 2012 Williamsburg Historic Triangle Tea Party Patriots, All rights reserved. Please join us at whttppatriots.com. Sent to alexanderofyork@gmail.com — why did I get this?